DEP issued another self serving press release to celebrate this weekend’s hosting of the Pequest’s 25th TROUT HATCHERY FREE OPEN HOUSE. Bob Martin and the Christie Administration may appreciate the tradition, but they are doing nothing to preserve that tradition and instead are seriously jeopardizing that tradition by rolling back water quality and land use regulations designed to protect trout. 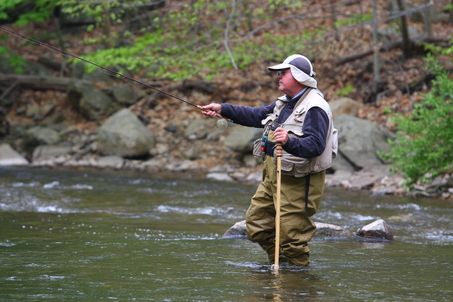 NJ’s trout streams receive special protections under a host of DEP regulatory programs. Additionally, many trout streams are located in the NJ Highlands region and are protected by the Highlands Master Plan, which is under attack by the Christie Administration and the Governor’s appointed minions on the Highlands Council. But for today, instead of laying out the comprehensive nature of the threat, I’d like to focus on the most pressing threat to the health of trout waters, the DEP waiver rule. Under the DEP waiver rule, the DEP Commissioner is granted extraordinary power to waive virtually any regulatory protection deemed by a permittee to be “unduly burdensome” or to conflict with other regulations. Additionally, permittees are given an opportunity to seek a waiver from any regulation if they can demonstrate that they can provide a “net environmental benefit”. There are no technical definitions or scientific methods to apply “undue burden” or “net environmental benefit”. Therefore, waiver decisions will be made on an ad hoc case-by-case basis, which means that they will not be governed by any consistent and scientifically based methodologies, criteria, standards, Guidance document, Technical Manual, or overall policy. The vague nature and ad hoc practice of issuing waivers in the absence of science based methods invites abuse, increases uncertainty in permit decisions, reduces predictability and transparency, and will increase permit delays and backlogs. Each DEP program and individual staffer writing permits will have their own perspective on how to waive requirements. Chaos will ensue as permit applicants forum shop. Waiver reviews divert scarce DEP staff resources from the Agency’s core mission and undermine the public confidence in the integrity of the Department. So, in addition to these severe management and policy problems, given the Pequest Trout Hatchery Open House celebration, we thought we’d provide a few illustrations of exactly how the DEP waiver rule would harm NJ’s sensitive high quality trout waters (wonks can hit the links below to read the rules). Trout are a sensitive species that requires clean and cold water to survive. Freshwater wetlands that drain to designated trout streams are classified as “exceptional value wetlands” and given 150 foot wide buffers. Those buffers filter water pollutants from the trout streams and provide vegetation that shades the stream and helps keep water temperatures down. Under the waiver rule, a builder or other construction project could be provided relief from the buffers, allowing development to destroy those protective buffers. Streams that are able to sustain naturally reproducing trout are defined as “Trout Production” (TP) waters. TP steams are classified under DEP Surface Water Quality Standards as “Category One waters” (C1). 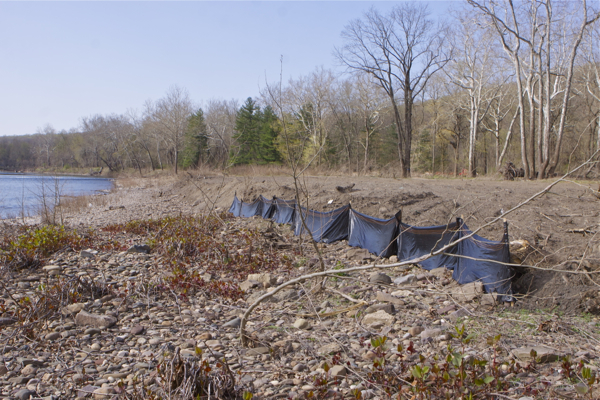 C1 waters are afforded 300 foot wide stream buffers (on each side of the stream) as BMP’s under the storm water management and stream encroachment regulations. These buffers limit development and are strongly opposed by land owners and builders. 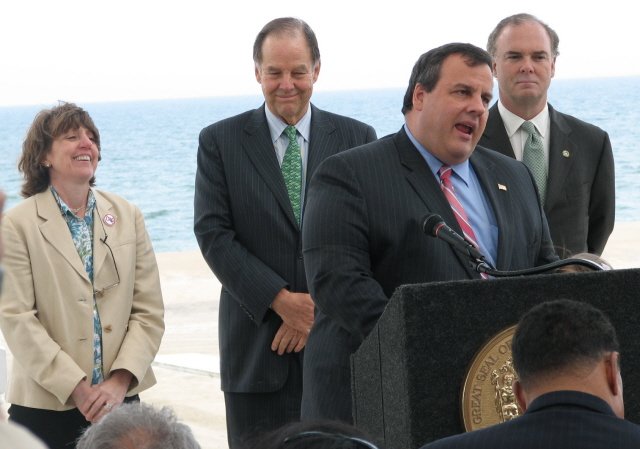 Under the DEP waiver rule, builders will receive waivers from the 300 foot C1 buffers. Stormwater from rainfall running off developed impervious surfaces carries pollutants to nearby streams and causes erosion. The resulting sediment and pollutant loads destroy trout streams. DEP stormwater regulations require and encourage various stormwater BMPs, most importantly to recharge water on the site, protect water quality, and avoid or minimize erosion. By recharging storm water into the ground, nearby stream benefit as groundwater provides “base flow” during the hot summer and periods of low rainfall. BMP’s cost money and can reduce development. Builders view them as “unduly burdensome” and they will seek and be issued waivers from DEP stormwater requirements and BMP’s. Trout will suffer. Many development projects and other so called “point sources” (pollution discharge via pipe, sewage treatment or industrial sources, etc) are required by DEP to conduct stream studies to assess the impacts of their projects and mitigate impacts. These studies cost money are are considered “unduly burdensome”. They will be waived and water quality will decline and trout will suffer. DEP requires that many polluters monitor their pollution (compliance monitoring) and/or the ambient water quality nearby. This information is vital to setting protective permit conditions and enforcing them. But monitoring costs money and is considered “unduly burdensome”. Waive it goodbye. DEP policy is to prevent degradation of high quality waters. The presence of high quality trout waters results in limits on the total capacity (wastewater flows and pollutant loads) that may be allocated to regional sewage treatment plants. In turn, these limits on capacity restrict the amount of development that may occur in the watershed. As such, the local sewer authorities view them as”unduly burdensome” limits on their operating revenues and the builders view them as limits of development. A good example is the Sussex County Municipal Utilities Authority plant which discharges to the Walkill river near the National Wildlife Refuge. The capacity of the plant is limited, which limits development in this environmentally sensitive watershed. Kiss those limits goodbye – they unduly burden development. Trout require cold flowing streams. Some of these stream are protected by DEP set minimum stream flow and temperature requirements. DEP requires some permittees to release water to meet these minimum flow or temperatures to protect trout. Releases from the Newark reservoirs to the Pequannock River are a good example – but this costs money and is viewed as unduly burdensome. Waive those protections goodbye. DEP issues permits to pump groundwater or divert streams or rivers for water supply. One of the factors DEP considers in deciding how much water that can be diverted to water supply Â in an environmentally sound way is impacts on the flows of streams. Trout streams are given special consideration. Water allocation permit applicants are required to conduct costly studies to assess these kinds of impacts. Builders, landowners, business and economic development interests view DEP studies and permit conditions as limits on available water as undue burdens on economic growth and development. DEP issues permits to developments of over 50 units the rely on septic systems. Nearby trout streams are given buffers and other protections that limit the location, design, and size of the septic system, and thereby limit development potential. Landowners and developers see the costly DEP mandated studies and permit restrictions as “unduly burdensome” limits on development. Bye-bye. DEP water quality management planing rules – which dictate where sewers are located and how much wastewater treatment capacity is assigned to a regional sewage treatment plant – dramatically impact land use and economic development. The WQMP rules require numerous planning, mapping, and scientific studies related to land use and water quality. These studies cost money and the rules limit development. Builders, landowners, public authorities, and county governments view these rules as excessively prescriptive and unduly burdensome. DEP Highlands regulations set forth comprehencie requirements to protect critcial Highlands waters and natural resources, including a restrictive 88 acre minimum lot size (septic density) in the preservation area. These regulatory restrictions are strongly opposed by land owners and builders as “unduly burdensome”. Trout streams benefit from these protections. All of them can be waived. Given the mitigation, land swaps, and pollutant trading schemes that are already approved by DEP, I can’t even begin to imagine the kinds of abuse that this will invite. Incommensurables – apples – oranges – grapes – the sky is the limit. Land for water – water for wildlife – air quality, energy, recycling and a multitude of other “good deeds” will be used to relax various regulatory requirements. Just use your imagination- and then ask Bob Martin: Let’s Make a Deal! A key aspect of the Obama EPA’s proposed “first ever” carbon emissions standard is being completely misunderstood and misrepresented by the media and politically loyal environmental groups. Power plants account for about 40 percent of America’s global warming emissions with the bulk of that coming from [unregulated and exempted] coal-fired plants. On Tuesday, the Obama administration took another important step for public health and the environment, proposing the first nationwide limits on carbon dioxide from new power plants. If approved, the new limits will accelerate the shift from coal to natural gas and cleaner alternative fuels. But exactly the opposite will occur – instead of accelerating the shift away from coal, the new rules would lock us into coal power plants for another generation – here’s why. There are about 500 existing coal power plants. Most of them are old and because they were expected to shut down, were grandfathered from many pollution control requirements by a huge loophole in the 1970 Clean Air Act. The new Obama EPA carbon emission standard applies only to new facilities – it does not apply to these existing coal plants. The bill does not, however, impose any performance standards on existing power plants. And it explicitly removes these plants from the reach of the Clean Air Act. This is a mistake. The overall cap on industrial emissions will not be fully effective for a long time, and, meanwhile, the government should be able to impose lower-emissions requirements on the older, dirtiest plants. EPA Administrator Jackson went even further – she said that not only does the rule not apply to existing coals plants, but that EPA “has no plans” to regulate carbon emissions from existing coal plants. But it gets even worse: the EPA proposed carbon standard rule explicitly exempts existing coal plants from any carbon emission standards if it upgrades to meet new mercury and other pollution control standards. EPA recently adopted two major new air quality regulations that will apply to and have significant economic impacts on these coal plants – in December 2011, the Mercury rule and in July 2011 the Cross-State Air Pollution Rule. In addition to those 2 rules just adopted, there are big rules in the pipeline. EPA is considering additional rules that could have signifiant impacts on coal plants. The Cooling Water Intake Structures Rule, the Coal Combustion Residuals Rule, and the greenhouse gas emissions rule that was just announced. EPA has signaled retreat on those rules. The unknown impacts of pending rules creates considerable economic uncertainty for the energy industry in terms of evaluating strategic options and decision-making, particularly in estimating compliance costs, payback periods, and return on investment at these old coal power plants. Basically, existing coal plants now will have two decide whether to: a) retrofit with costly new pollution control technology; b) switch fuel from coal to natural gas; or c) shut down the plant. Obviously, from an environmental standpoint, plant shutdown is the best option. The energy industry attacked the EPA mercury and Cross-State rules by claiming they would be so costly that they would shut down many plants, leading to local power outages, brownouts, and loss of “grid reliability”. President Obama directed EPA to evaluate this issue and the US Department of Energy prepared a Report on it that supported the EPA rules and rejected energy industry claims regarding “grid reliability” problems. The decisions about whether to shutdown, fuel switch, or retrofit an old coal plant are complex. Basically, the factors include the cost of the pollution control; how long the facility can remain operating to generate revenues to pay for the pollution control; and uncertainty based risks associated with the price of fuels and any future new EPA pollution control regulations. So, in considering the pollution control retrofit option, in addition to the costs of compliance with the EPA mercury and Cross State rule, coal plant owners had to consider future regulation. If they chose to retrofit at a cost of hundreds of millions of dollars and keep the plant open another 30 years, would EPA impose even more costly requirements in the future by regulating carbon emissions? The uncertainty and costs of future EPA regulation of carbon emissions was a big factor in deciding whether to shut down old coal plants or remain operating. EPA just resolved that uncertainty. Here in NJ, PSEG already made that decision, by choosing to invest $1.6 BILLION in retrofitting 2 old coal plants with pollution controls instead of shutting them down or converting to natural gas (see: NJ Pays Over $1.5 Billion To Keep Obsolete Coal Plants Open). So, just as the energy industry was considering these huge decisions across the country, the Obama EPA needlessly weighed in to tell them: “don’t worry – we won’t regulate your carbon emissions”! Of course, that provided “regulatory certainty” that will impact the decisions about plant closure and very likely result in many coal plants retrofitting and staying open for another 30-40 years. Christine Tezak, an analyst for Robert W. Baird & Co., said in a research note that the proposal is good news for today’s coal plants, which already face major investments due to other EPA regulations to curb mercury and toxic emissions. “The Environmental Protection Agency explicitly stated that these new standards would not apply to existing power plants that have increases in carbon dioxide resulting from upgrades related to conventional pollutants,” Tezak wrote. There has been lots of activity since we last posted on 3/25, so a quick update on Bulls Island is in order. I’ll do the photos first and the regulatory stuff second. 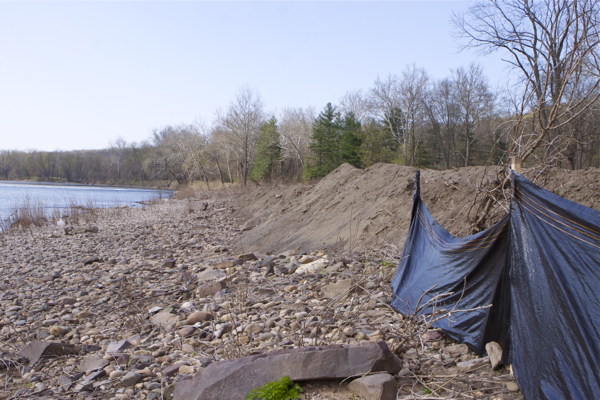 First some good news – I visited the site again today and noted that all the tires and most (but not all) of the debris had been removed from the riverfront fill and that a 100 foot sediment control fence was installed (see above photo). Now the bad news: for some reason the fence was only installed along 100 feet of the 450 foot long riverfront fill. Worse, it looks like DEP plans to leave the debris & fill in place and not even try to restore the natural vegetation that was destroyed. That is not acceptable and I will seek removal and restoration during the enforcement process. this is the natural condition, just 100 feet downriver. 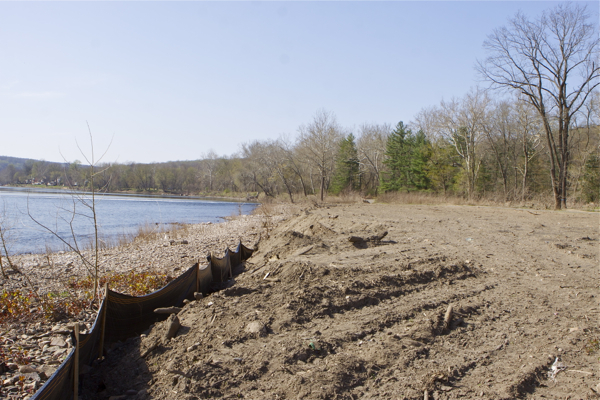 The NJ Water Supply Authority was conducting what they felt was routine maintenance dredging under a USACE permit and a DEP wetlands General Permit. 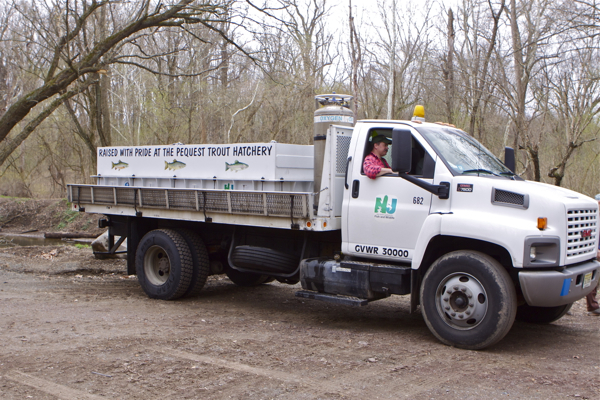 On 3/21, I witnessed them filling a dump truck with dredge material for offsite disposal. A state parks employee told me that NJWSA bulldozed debris and fill along the river at their request as a courtesy. A NJWSA rep told me that 98% of the riverfront debris and fill was NOT from the Canal dredge operation. This is important because both the USACE and DEP permits restrict storage and disposal of dredge material and debris. Both permits do not allow riverfront disposal. NJWSA says they have an agreement with DEP on the the wetlands permit which seasonally restrict dredging to protect trout. 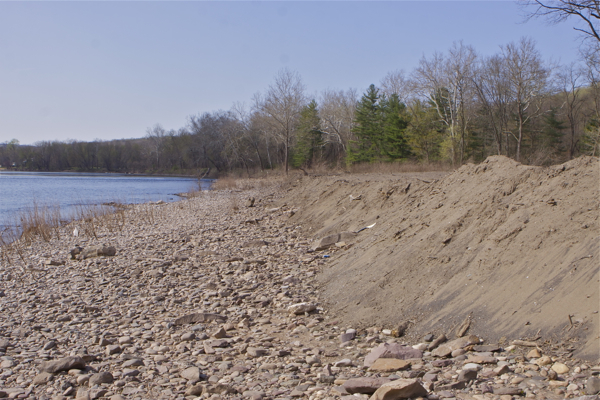 NJWSA says that seasonal trout restriction and any soil erosion management practices are not necessary. The DEP wetlands permit also requires fences and seasonal restriction to protect wood turtle. NJWSA did not comment on that. 1) US Army Corps of Engineers (D&R Canal dredge); 2) NJ DEP (wetlands permit for canal dredge and unp-ermitted activity along riverfront); 3) D&R Canal Commission (canal dredge and riverfront fill and disturbance: 4) Hunterdon County Soil Conservation Service (canal dredge and riverfront disturbance); and 5) Delaware River Basin Commission (not sure exactly what their role is). The USACE permit has a number of conditions that appear to have been violated. I sent a detailed letter to the USACE requesting compliance inspection for their permit. Let me know if you’d like a copy. The DEP permit had a number of conditions that appear to have been violated. Most significant include: 1) fencing and seasonal restrictions to protect wood turtle; Â 2) seasonal restrictions to protect downriver trout stocking; and 3) compliance with soil erosion and sediment control plan requirements. I requested DEP enforcement inspection but not been more specific. DEP land use enforcement advised me that DEP inspected the site on 3/13 and remarkably found no violations. I have no idea what they were looking at. After I submitted photographs documenting violations, they agreed to reinspect the site and meet with the NJWSA and Park Supervisior. I don’t yet have documents on what occured. DEP staff conducted a permit database search and told me the there were no permits issued for this activity. What was done there appears to be a flagrant violation of DEP flood hazard control act regulatory requirements and local SCS soil erosion and sediments controls (the area was 450 feet by 30-100 feet, far greater than the 5,000 square foot threshold for permits). 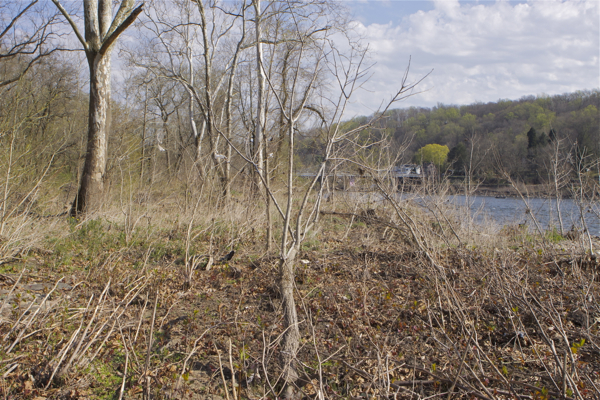 I referred this for enforcement to USACE, DEP, Hunterdon County SCS and D&R Canal Commission. I haven’t heard anything back from those agencies yet. However, I do know that DEP, D&R Canal Commission, and Hunterdon Co, SCS all conducted inspections. This is the most important issue. I filed an OPRA request for these documents. Today, DEP requested an extension until April 5. In other matters, I am aware that Delare Riverkeeper filed a DEP Hotline complaint and is involved. I’ve provided info to NJ Audubon and requested their support, particularly on the bird habitat issues related to any planned tree removal. They seem interested and supportive. 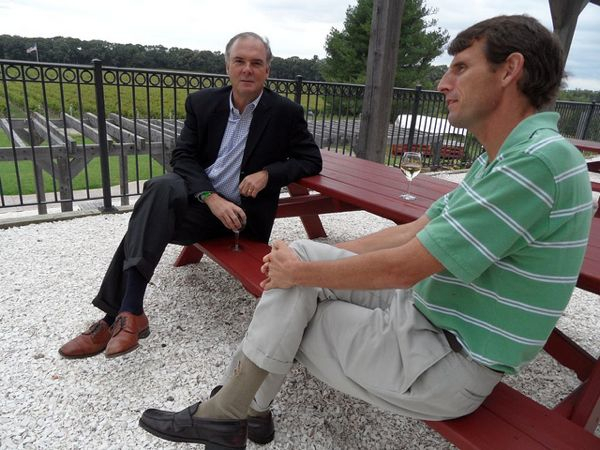 I spoke with editor of the Hunterdon County Democrat – they should be doing a followup story. The DEP Press Office (Larry Rangonese) is unrepentant and continues to attack me and question my motives. We will keep you posted. More photos shot today below. view from the new landfill - will DEP revegetate? [Update: I knew that the press coverage was going to take the EPA spin and ENGO’s would applaud – that’s the pattern that Lisa Jackson knows how to exploit, particularly when the issues are complex and 99% of media and ENGO’s are clueless and haven’t actually read the rule. But this proposal is not just the standard harmless symbolic gesture and spin. No one seems to realize that not only does this proposal do NOTHING to reduce current emissions, but it lock the US into another generation of coal power! For 30-40 more years! And that means another 30-40 years of ancient coal power plants! So this latest rule might be mostly symbolic â€” a way of recognizing that global warming is a problem but not taking dramatic steps to cut emissions further. Today EPA touted a new proposed rule that would regulate carbon emissions emissions from new (future) power plants. But instead of being perceived as a positive move forward to reduce carbon emissions, the proposal highlighted a fatal flaw in EPA’s approach to regulating greenhouse gas emissions. Ironically, perhaps in deference to powerful polluters, EPA itself invited this scrutiny by very clearly stating – right up front – that the proposal applies only to NEW plants and explicitly does not apply to existing plants. I have been trying here – unsuccessfully until today – to get focus on those flaws in EPA’s “tailoring rule”, an approach which replicates the failed approach under the Clean Air Act, which grandfathered existing dirty mid-west coal power plants. The key assumption – proven incorrect – was that these dirty old coal plants would retire at the end of their design life. That has not happened. The tailoring rule essentially creates the same regulatory loopholes with respect to existing plants. EPA’s “New Source Review” enforcement program, which attempts to subject these grandfathered coal plants to current standards when major modifications are made to upgrade the plants and extend their lifetimes, has failed to close these loopholes. Consistent with this failed pattern, today’s EPA proposed rule would have no impact on carbon emissions from existing power plants. Over 50% of US electric power production is from coal power plants. On a press conference call earlier today, EPA Administrator Jackson faced several questions from reporters asking why EPA had no plans to reduce carbon emissions from existing coal power plants. In response, Jackson emphasized Â – at least 3 times – that EPA “has no plans to regulate carbon emissions from existing plants”. This rule comes in the wake of strong political pushback from the energy industry on EPA’s recent mercury and inter-state emissions rules. So, Obama has caved (again), this time to Big Coal. The EPA rule proposes a carbon emission standard of 1,000 pounds per megawatt of power generation. All planned and new natural gas plants and 95% of existing natural gas plants built since 2005 already meet that standard. So the proposal would have no impact on new natural gas plants. Recognizing this reality, EPA Administrator Jackson stressed that the 1,000 lb/Mw carbon standard is based on existing technology and planned investments in new natural gas power plants, and therefore would have no impact on power plant technology, energy Â planning, or economic investments. “we are meeting the market where it is”. Jackson then was asked by a NY Times reporter whether EPA models estimated how many tons of carbon would be reduced over the next 10 years, compared with business as usual (BAU). It is difficult to do that.. We don’t know who is going to build. We are not trying to predict the future. EPA should be actively shaping the energy future and actively encouraging the shutdown of existing coal power plants and erecting regulatory barriers that amount to a moratorium on construction of new coal plants. Instead, the proposed rule has no impact on existing plants, no impact on new gas plants, and allows new coal plants with CCS technology. It therefore will have no impact on current carbon emissions and will allow future carbon emissions from the power sector to grow unconstrained by any regulatory limit. This is a prescription for cooking the planet. But EPA did not only abdicate – the rule actually creates a new path to encourage more new coal power plants. In addition to the carbon emission standard, the rule proposes a regulatory path that promotes the controversial carbon capture and sequestration (CCS) technology. 2) meet the 1,000 lb/mw standard over a 30 year averaging period by installing CCS at some future date , with 50% carbon capture rate. The CCS technology is extremely controversial and has not been proven technologically feasible, reliable, and cost effective. Some have argued that CCS is a bridge to a clean energy future. But even if one buys that argument (which I don’t), it can NOT work under EPA’s approach because EPA has rejected requiring retrofit of CCS on existing coal plants. Worse, EPA has exempted existing coal plants that upgrade to meet new mercury and interstate rules (and thereby extend their design life another 40 years) from any carbon emissions standards. This locks the US in to coal power from existing plants for another 30 years. For new coal plants, CCS is a huge gamble. It is therefore premature – at best – for EPA to be promoting this technology for new coal power plants. With scientists calling for steep reductions in CURRENT carbon emissions, this EPA proposal in grossly irresponsible. The “piggishness” Senator Beck alludes to, as reported in today’s Asbury Park Press, is having water consumers – me and you – pay for country club dues, corporate marketing, and – get this – lobbying. So, we are paying for a private water company to lobby legislators and regulators to increase their profits and weaken public health and environmental protections over the quality and quantity of our water supply! The resolution cites witness testimony that said the water companyâ€™s costs included country club, lobbying and marketing fees in its calculation. This is happening at a time when company profits rose by 16% in the last quarter. As we’ve written, privatization and deregulation of water is not in the public interest (e.g. see this and this and this and this). We read that in Italy and Greece, bankers are dictating policy to democratically elected governments. Some of the dictates include mandating that labor laws be weakened, pension benefits be reduced, and water be privatized. We have this trend now where instead of democratically elected governments controlling these countries, so-called technocrats, the central bankers, are coming in, taking over as the prime ministers of governments in Italy, in Greece. In Italy we have Monti, and in Greece we have Papademos. These are supposed to be neutral arbiters of economic policy, but in fact are mostly doing the bidding of the large banks. And the other European countries, especially Germany, they want austerity. And what’s amazing to me about is they’re going way beyond any kind of narrow policies with respect to debt repayment, monetary policy. They’re going into the deep core of social and economic policy in many of these countries. And that letter from the central bank, the European Central Bank, that you described went to the highly contested issues that have plagued Italy for many years about labor laws, privatization, and many others. Here in the good ole’ democratic US of A, the dictates from Wall Street are not so transparent and heavy handed. So why is it that the news papers never report these austerity, privatization and deregulation policy responses to Wall Street threats as fundamental attacks on the concept of democratic government?